Just wanted to send you some neighborhood-related information. First, we're having a cleanup and trail-clearing day on the Corbett Slope this coming Sunday, March 9 − 11AM until the last one leaves. We'll have snacks and drinks and tools. This incident happened in January, but others have reported similar occurrences in Corbett Heights as well as in neighborhoods across the city. I wanted to alert you and if you want to share with others in the neighborhood. I think this man was unstable and came to my door in late January in the late afternoon. 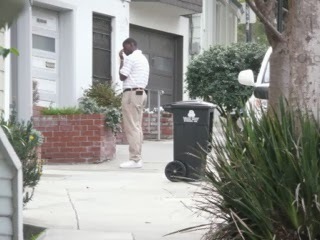 I called the police after he left, as I felt that this man was "threatening" in his demeanor and I felt very uneasy. My doorbell rang and when I looked through the peephole, there was no one there. Since UPS sometimes does that and leaves a package, I opened the door. As soon as I did, a man appeared from the side up the street nearby, since he probably heard me open the door. He was soliciting for money to donate for something (don't know what) and I asked him if he could leave some literature for me to look at since I didn't have time right now. He pushed his receipt book into my hand and said please give me a donation and I will write you a receipt. I don't even know what it was for… He had a few dollar bills in his hand and I gave him his book back. He started to plead for a donation and I repeated that I am sorry I don't have time right now and just leave me some literature to look at. He seemed to be distressed and I said again, I have to leave. He shouted at me, "I have Aids and I hate you!". I was so startled. I repeated that I am sorry and closed my door. I called the police to report this. And last, if you haven't been to our website, please check it out. There will be updates coming. And please consider joining. Membership is only $15 per household (funds used primarily to support our green spaces) and you can subscribe with PayPal.